This is the first all-hazards guidance manual for local planners developing plans for post-disaster recovery and reconstruction. It includes a model ordinance and case studies of five different hazard scenarios: flood, earthquake, tornado, wildfire, and hurricane. The report also offers planning tools for managing long-term community recovery after a natural disaster. 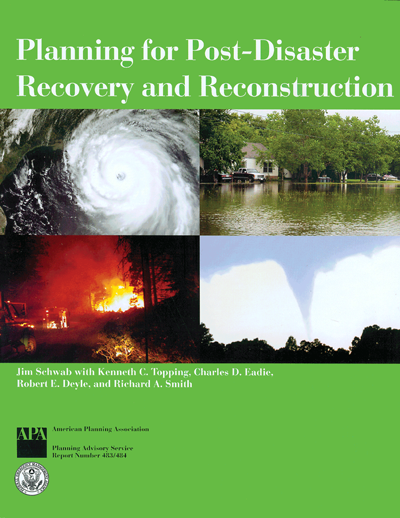 Specific chapters provide guidance for identifying local natural hazards, assessing risk, and outlining the process of developing and implementing plans for post-disaster recovery and reconstruction. Appendices include a list of key federal contacts and a glossary of disaster terminology. This report was prepared under a cooperative agreement with the Federal Emergency Management Agency (FEMA).